A few weeks ago, I shared my morning routine and promised an update on my efforts to add exercise into the mix. Well, after some false starts I may have found the perfect workout to fit in before breakfast. I used to run several miles a day, did Insanity, and trained for a couple half-marathons. I loved the high I got from working out. However about six months ago, I realized that my workouts were stressing me out! I was worrying about making time to fit in runs between work and making dinner. I constantly felt rushed and was beginning to dread going to the gym. So I stopped and ever since then, exercise and I have been on a break. As a result, when I started looking for a morning workout routine, it was particularly important to me that I wake up actually looking forward to it. If something’s not fun and manageable, the likelihood of keeping it up becomes fairly slim. I’ve always enjoyed body-weight exercises, because they’re simple and can be done almost anywhere. Sit-ups, squats, and lunges are easy to bust out during an episode of The Good Wife. About a year ago, I read this New York Times article entitled “The Scientific 7-Minute Workout.” The workout, published in a peer-reviewed journal of sports medicine, consists of 12 exercises; each exercise is done for 30 seconds, for a total of 7 minutes. The key is that for the entire 7 minutes you need to exert maximum effort; you should finish totally out of breath and sweaty. This method of working out is termed high-intensity interval training (HIIT) and is very popular in the world of health and fitness blogging. Why so popular? Scientific research shows that training at a high intensity for a short period of time creates the same molecular changes in muscles that occur after several hours of biking or running. Getting an entire workout done in 7 minutes, say what?! Sign me up! At the time I didn’t actually try out the workout. I think we were doing Insanity that month, which already included a wide variety of body-weight exercises. However, a few weeks ago I revisited the article and decided to give it a try the next morning – and I loved it! The exercises are simple and easy, so I never had to stop to think about my form; I already know how to do a squat or a push-up. The workout flew by and left me tired but not exhausted. It gave me that little burst of endorphins I had missed, putting me in a good mood all morning long. For the first time in a while, I was exercising and it felt great! 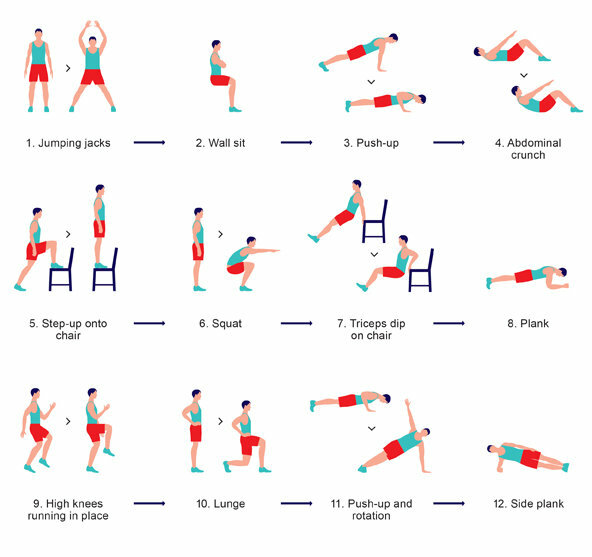 I’ve been doing this workout every morning for the last three weeks, in addition to going for long walks a few afternoons a week. So far I am still loving it. The exercises invigorate me in the morning and take so little time to complete that they’re not an inconvenience. By the time my husband’s out of his morning shower, I am done and ready for mine. I hope I continue to keep it up for the foreseeable future. Who knows, maybe in a few more weeks I may even be inspired to ramp up my walks into runs. Let me know if you try out this workout. I’d love to know what you think, or if you have any quick workouts of your own. I love these kinds of exercises! No equipment, no excuses! Many people don’t realize that you can get a great workout in at home. Keep up the great work!